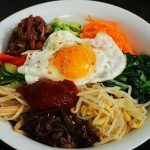 There are many variations on this dish, from simple to elaborate, and this recipe I’m showing you today is for one you could consider “classic” bibimbap. 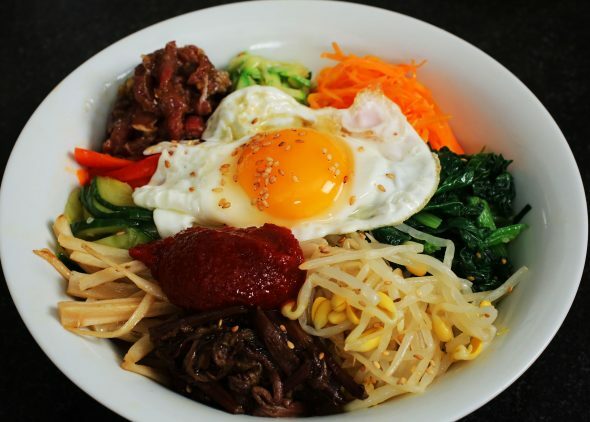 If you ordered bibimbap in a Korean restaurant, you would probably get something like this dish, with regional variations. I’m also going to show you bibimbap prepared and served in a heated stone or earthenware bowl called dolsot-bibimbap (돌솥비빔밥). 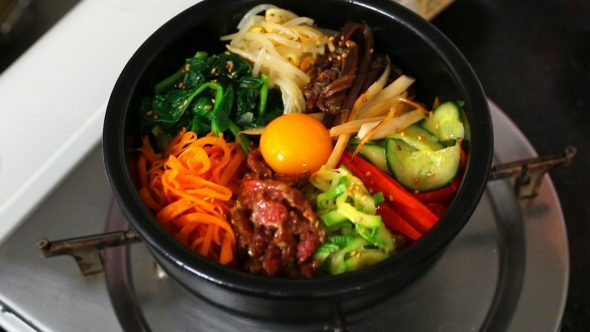 “Dolsot” means “stone pot” in Korean, and this version is well-known for the way the bowl makes a layer of crispy, crackling rice on the bottom of the bibimbap. 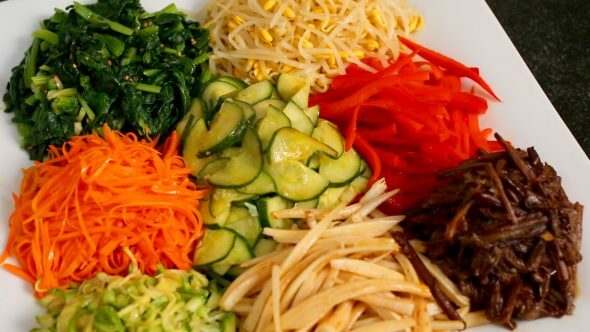 Even though we mix up bibimbap before we eat it, each ingredient needs to be prepared with care and individuality, bringing out their unique flavors, textures and colors so they come together beautifully in the bowl and deliciously in your mouth. The different ingredients aren’t random, they’re chosen because they balance, harmonize, and offset each other. This recipe isn’t quick and easy, it takes some time to make. But if you’re really in a rush you can make a great bibimbap with the soybean sprouts, spinach, and carrot (or red bell pepper, or both), and gochujang, sesame oil, and an egg— those items are unskippable! I’m going to share some more bibimbap recipes on my website in the future, and you’ll see how many different variations there are. 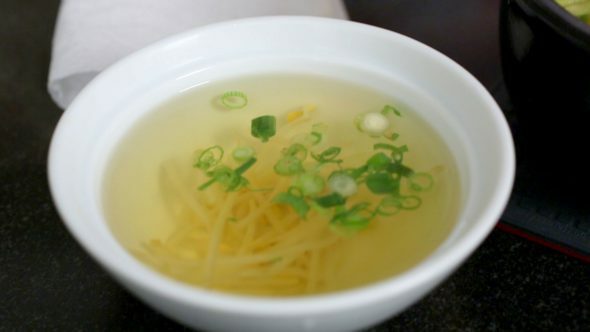 This version is a little different than the version in my cookbook, because I make a quick and simple soup with the bean sprouts. When I started my YouTube channel, bibimbap was one of the first recipes I made, because it’s such an essential dish in Korean cuisine. So I’m happy to remake the video now in HD with much better editing and instruction. I’ve been building up to this video by remaking videos for the ingredients, too. I remade yukhoe, and sigeumchi-namul, and my yukagaejang video has a lot of detail about preparing the mountain vegetable fernbrake. 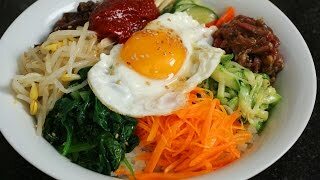 So if you’ve been following my videos, you’re now ready to be a bibimbap master! Ready? Let’s start! 1 ounce dried bellflower roots (doraji), soaked in cold water for 18 to 24 hours. If you have presoaked or fresh fernbrake you can use it straight away, but if you have dried fernbrake you’ll need to get it ready to eat. It’s fast if you have a pressure cooker, but if you don’t it will take some time. 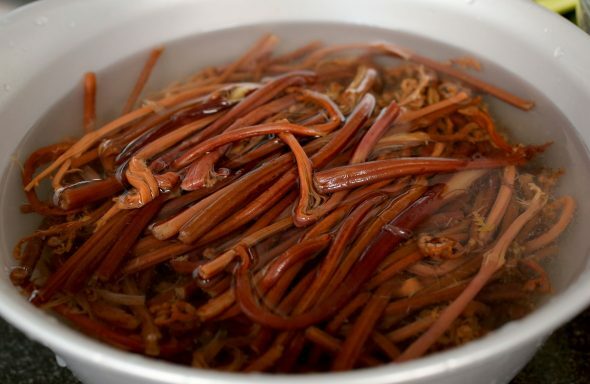 Wash ½ ounce of dried gosari and boil it with 5 cups of water in a pressure cooker for 30 minutes. Drain and rinse in cold water a couple of times. Drain. It should make 4 ounces. In a large saucepan add ½ ounce of dried gosari to 7 cups of water. Bring to a boil over medium-high heat and boil for 30 minutes. Cover and let stand until cool, about 2 to 3 hours. Rinse the fernbrake a couple of times, drain and put in a bowl. Cover with fresh cold water and let soak for at least 8 hours or overnight in a cool place, changing the water 2 or 3 times during the soaking. Taste the gosari: It should be soft. If it’s tough, boil it again in a fresh pot of water for about 20 minutes and then let it sit, covered, until soft. If you have a usual method for making rice or have a rice cooker, go ahead and make 5 cups of rice like you usually do. But here’s how I do it on a pot on the stove. 2 cups of dried rice makes about 5 cups of cooked rice. Rinse 2 cups of rice in cold water and scrub the wet rice with your hand. Rinse and drain until the drained water is pretty clear. Put the rice in a heavy-bottomed pot. Add 2 cups of water, cover, and soak for 30 minutes. Cook over medium high heat for 7 to 8 minutes until the surface is covered with abundant bubbles that are spluttering noisily and look like they’re about to overflow the pot. Turn the rice over a few times with a spoon and cover the pot again. Turn the heat to very low and simmer for another 10 minutes until the rice is fully cooked and fluffy. Remove from the heat. Fluff the rice with a spoon to release excess steam. Let the rice stand, covered, at room temperature to keep it warm. I like to get a big platter and then put each vegetable on it as they’re ready. I think it looks really pretty, but you don’t have to do this. When all vegetables are prepared and ready to use, the platter looks pretty delicious! 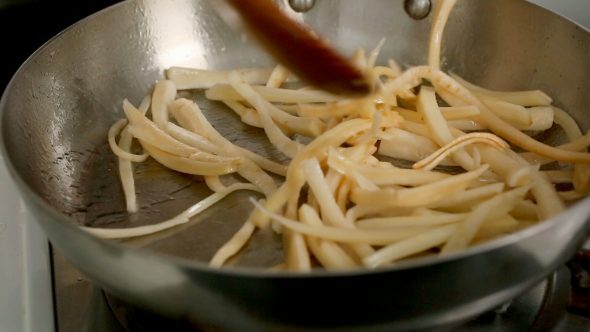 Put the soy bean sprouts in a pot and add 4 cups water and 2 or 3 teaspoons salt. Cover and cook for 20 minutes over medium high heat. Take out the sprouts with tongs and put them into a bowl, leaving about ½ cup of sprouts in the pot with the water you used to boil them. This is the soup to serve with bibimbap later. In a bowl, mix the sprouts by hand with ½ teaspoons salt, 1 teaspoon minced garlic, and 2 teaspoons sesame oil. Put them on the large platter. Cut up the blanched spinach a few times and put it in a bowl. Mix by hand with 1 teaspoon garlic, 1 teaspoon sesame oil, ½ teaspoon salt, and 1 teaspoon sesame seeds. 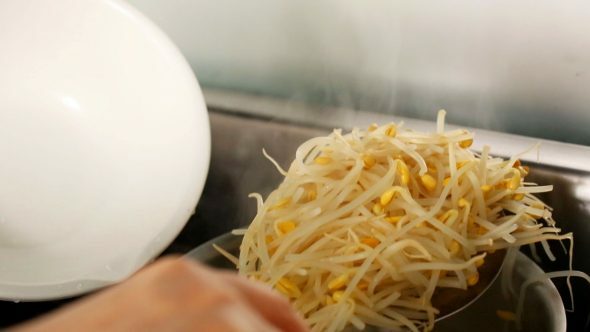 Cover and put it next to the soy bean sprouts on the platter. 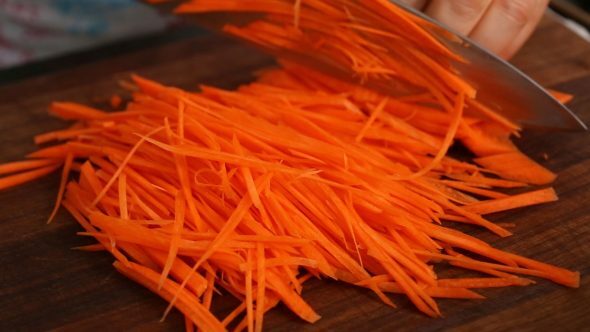 Cut the carrot into matchsticks, put them in a bowl, and mix with a pinch of salt. Let stand for 5 to 10 minutes until sweating. Cut the red bell pepper into halves, deseed, and slice into strips. Put them in a bowl. Cut the zucchini into matchsticks and mix with ½ teaspoon salt. Cut the cucumber into halves lengthwise and slice thinly crosswise. Mix with ¼ teaspoon salt. 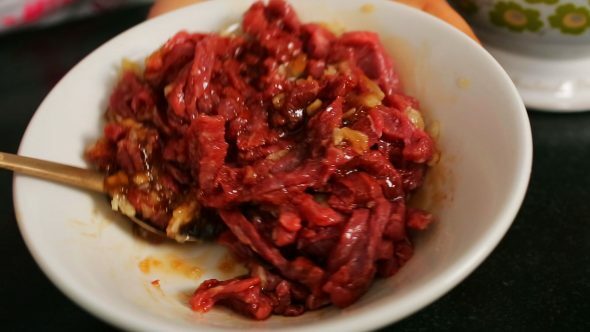 Cut the beef into matchsticks and put them in a bowl. Mix with 1 tablespoon minced garlic, 1 tablespoon soy sauce, 1 tablespoon honey, 2 teaspoons sesame oil, and 1 teaspoon sesame seeds with a spoon. Cover and keep in the fridge until ready to use. Cut the fernbrake (gosari) a few times into bite size pieces. Set aside. Put the bellflower roots (doraji) in a large bowl. Add 1 or 2 tablespoons salt. Rub for a minute to wilt slightly and release some of the bitterness. Rinse them in cold water a couple of times and drain. If you find some roots are too thick, split them lengthwise. Set aside. Heat up a pan over medium high heat. Squeeze out excess water from the carrot. Add a few drops of cooking oil to the pan and sauté the carrot for 1 minute. Put it on the platter next to the soy bean sprouts and spinach. Clean the pan with wet paper towel or wash it. Heat a few drops of cooking oil in the pan and squeeze out the excess water from the cucumber. Sauté with ½ teaspoon minced garlic and a few drops of sesame oil for 30 seconds. Put it on the platter. Clean the pan. Heat up the pan with a few drops of cooking oil. Add the red bell pepper and sprinkle a pinch of salt over top. Sauté for 30 seconds. Put it on the platter. Clean the pan. Heat up the pan and squeeze out excess water from the zucchini. Add a few drops of cooking oil and sauté with 1 teaspoon minced garlic, 1 tablespoon chopped green onion, a drop of sesame oil for 1 minute until slightly softened. Put it on the platter. Clean the pan. Heat up the pan with a few drops of cooking oil. Add the bellflower roots and sauté for 2 to 3 minutes. Lower the heat to medium so as not to brown them. Add 1 teaspoon minced garlic and a drop of sesame oil. Stir for another minute until a little softened. Put it on the platter. Clean the pan. Heat up the pan. Add a few drops of cooking oil. Stir the gosari for 2 minutes until a little softened. Add ½ teaspoon of minced garlic, 2 teaspoons soy sauce, and 2 teaspoons sugar, and keep stirring for another minute. Put it on the platter. Here are a couple of ways to serve: bibimbap in a regular, shallow bowl, and dolsot-bibimbap in a stone or earthenware bowl. Reheat the soybean sprout soup. Divide the cooked rice into 4 portions. Each portion will be a little more than 1 cup of rice. Put the rice in each of 4 bowls and arrange the vegetables and beef on the rice. Top with the egg yolk and gochujang. If you prefer your eggs and beef cooked, make sunny side up eggs and slightly pan-fry the beef before putting them on the top of rice. 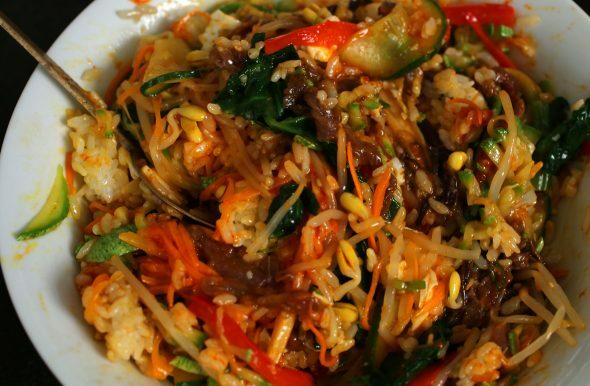 Sprinkle the bibimbap with the sesame seeds and drizzle with sesame oil to taste. Ladle the soup to a small bowl and sprinkle some chopped green onion over top. Serve right away with more hot pepper paste on the side. Put a few drops of sesame oil in the bottom of each of 4 earthenware bowls. They should be big enough to hold 4 to 6 cups each. Divide the rice among the bowls. Arrange the vegetables and beef on the rice. Top each serving with an egg yolk and 1 tablespoon gochujang. If you prefer your eggs and beef cooked, make sunny side up eggs and slightly pan-fry the beef before putting them on the top of rice. Set each pot on a burner. Heat over medium high heat until you hear a ticking, crackling sound coming from the rice. Sprinkle the bibimbap with the sesame seeds, drizzle with sesame oil to taste. Gently but firmly mix everything together in the bowl with your spoon. Try not to crush the more delicate ingredients. Posted on Sunday, January 6th, 2008 at 11:14 pm. Last updated on April 17, 2016. Posted April 6th, 2019 at 9:03 am | Log in to reply. I made bibimbap today to clear the leftover ingredients in my fridge. Although i didn’t have all the ingredients, the bibimbap was still really tasty! 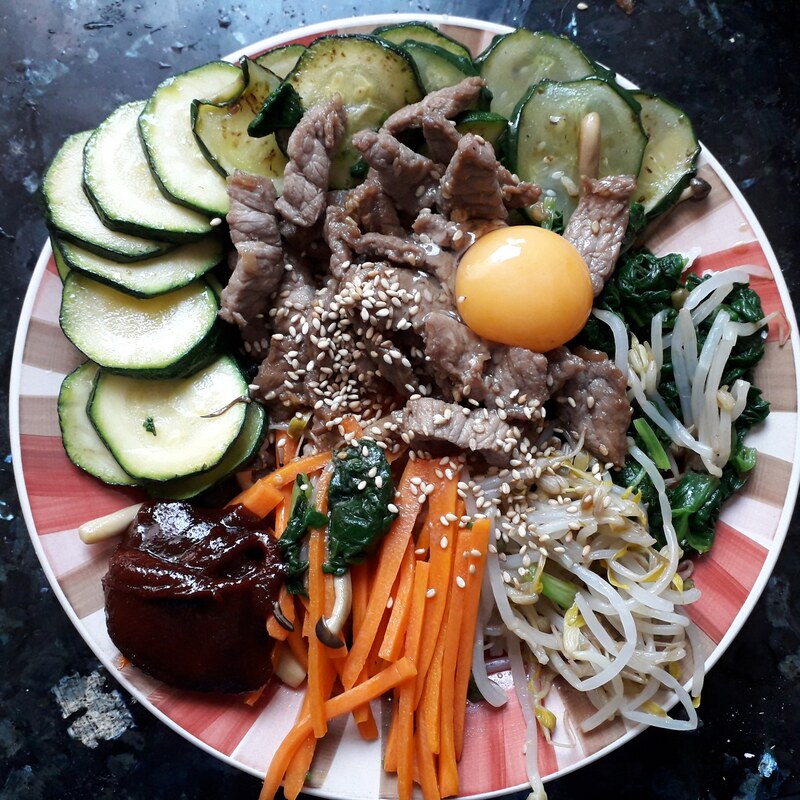 My sister loved the honey-marinated meat especially :) this is one of my first few tries at making korean food, so I’m glad how well it turned out! Posted April 3rd, 2019 at 10:20 pm | Log in to reply. Oh, ThNk you Maangchi. This was so delicious. I used your recipe for a vegan bulgogi and I even made a vegan egg yolk to pour on top. It was so yummy. Thank you thank you. Posted February 26th, 2019 at 12:08 pm | Log in to reply. Today we made bibimbap! Unfortunately our Asian Supermarket does not bring fern or bellflower root, so I substituted them with mushrooms. It was also very fun to cook. Can’t wait to make more of your dishes. Posted February 27th, 2019 at 8:55 am | Log in to reply. It looks great! Happy cooking! Posted April 3rd, 2019 at 11:16 am | Log in to reply. Posted February 20th, 2019 at 4:05 am | Log in to reply. For the veggies, I don’t use zucchini; red bell pepper; gosari (fernbrakes); and doraji (bellflower roots) here. I don’t think doraji is imported to our country. For the gosari, my mom once ever said if ferns are difficult to handle. Wrong cooking method could result in poisoning. And also I think that the one you use is different from the fernbrakes in our country (it’s always green after cook, never turned brownish or even blackish). Posted February 20th, 2019 at 4:12 am | Log in to reply. It looks mouthwatering! The information about your modification is very helpful! Posted February 20th, 2019 at 3:54 am | Log in to reply. Lately, I think maybe there’s some Indonesian too out there who wants to try to cook bibimbab and still feels confused about the replacement ingredients. 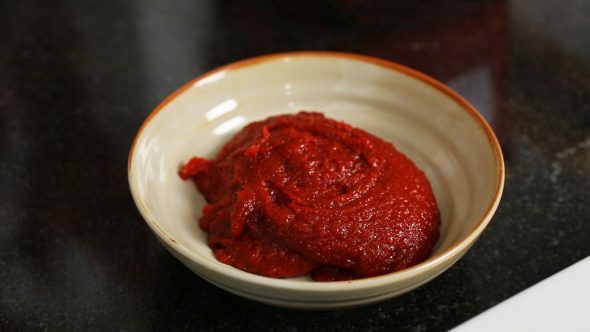 So, I’ve decided to post my modification version (joesonghamnida, Maangchi-ssi ^^) for the gochujang and veggies. I mix 1 red chilli pepper, 3 cloves shallot, 2 cloves garlic, 1 candlenut, and ginger (about 1 cm in length). Sautee the mixture with 1 tbsp of vegetable oil, a bay leaf, a pinch of salt, a pinch of white pepper powder, 50 ml of water, and 1 tbsp of sweet soy sauce until the water reduced and the mixture gets its viscosity back. This recipe was originally posted on January 6, 2008 at 11:14 pm by Maangchi. It was last updated on April 17, 2016. The video was watched 6,561,158 times on YouTube & has 106,007 likes! This video is a remade version of an earlier recipe. The original video was posted on 2008-01-07 and has 1,027,516 views.